Kim Kramer, a trade supervisor for facilities management and planning at UNL, places pins in a lock. 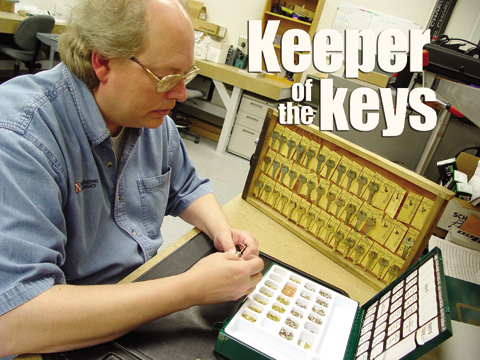 Kramer, who also plays guitar in the classic rock band, "Rocking Fossils," has found a home at UNL as a locksmith. Photo by Troy Fedderson/University Communications. Doors are opening for Kim Kramer. In 1988, E.N. "Jack" Thompson, leader of the philanthropic Cooper Foundation, conceived of a public lecture series that would bring prominent international speakers to UNL. The Scarlet has opened the fall semester with a new look designed for UNL faculty and staff. Offices in Seaton Hall are celebrating the redesign and renovation of the building by holding an open house, 11:30 a.m. to 2 p.m., Aug. 31, for all faculty, students, and staff. For the second straight year, UNL has made U.S. News and World Report's annual America's Best Colleges rankings' Top 50 list for public national universities. It appears no name change is in the offing for the UNL College of Agricultural Sciences and Natural Resources. UNL expertise has fast tracked a west coast discovery into the fossil record books. Recent UNL research on soybean oil is helping shape food allergen labeling laws here and abroad. Cortney Davis, 2003 winner of the Prairie Schooner Book Prize in Poetry for her collection Leopold's Maneuvers, will be reading, 7 p.m., Aug. 31 in the Dudley Bailey Library in Andrews Hall. University Theatre five-admission passports and individual show tickets go on sale Aug. 29 at the Lied Center Ticket Office. Fall productions in Howell Theatre are, The Wonder of the World, and The Seagull. Spring productions in Studio Theatre are Wiley and the Hairy Man, and Fires in the Mirror. The Learned Ladies rounds out the season in a venue to be announced. For more information call 472-4747 or go online to http://www.unl.edu/theatrearts. In celebration of the World Year of Physics 2005, the UNL Department of Physics and Astronomy presents actor Tom Schuch in the one-man show, Einstein: A Stage Portrait, by Willard Simms. At the beginning of the famous novel, "Remembrance of Things Past," the mere taste of a biscuit started Marcel Proust on a seven-volume remembrance. Here a bulldozer turns up an old doorknob, and look what happens in Shirley Buettner's imagination. The exhibition April Gornik: Paintings and Drawings will be on display at the UNL Sheldon Memorial Art Gallery, Aug. 27 to Oct. 23. In a July 30 ceremony, the Sheldon Memorial Art Gallery and Sculpture Garden at UNL named its first permanent collection gallery space in honor of alumnus Carl "Ky" H. Rohman and his family. An annual botanical print competition is looking for a few good sunflowers.